Inspired by the clean lines of ice formations, the Tibor pendant light by Tech Lighting exudes class and sophistication. This sophisticated pendant is made of solid crystal giving it a slight dramatic flair. 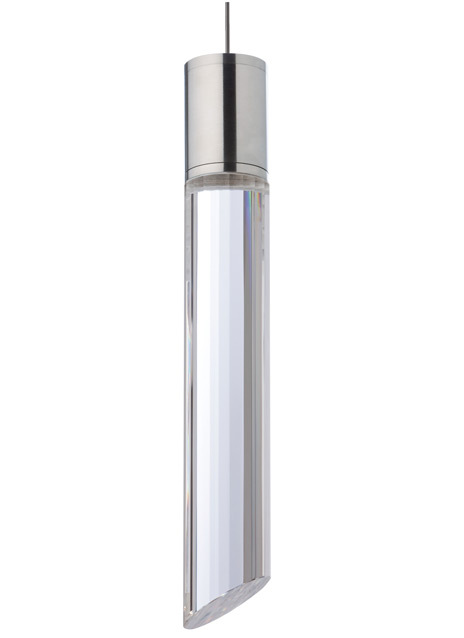 An upper metal cap, that features three on-trend finishes, carefully hides the internal downward firing LED light module allowing light to radiate brilliantly onto surfaces below. A fully dimmable, energy efficient, LED lamp ships with the Tibor saving you both time and money. The elongated scale of this pendant makes it ideal for dining room lighting, foyer lighting and hallway lighting. No matter the lighting application the Tibor pendant is sure to add sophistication and drama to any space. Includes 6 watt, 500 gross lumens, 3000K, replaceable LED module. Ships with six feet of field-cuttable suspension cable. Dimmable with low-voltage electronic or magnetic dimmer (based on transformer).